Our Little Place, I feel so supported. Just wanted to share my first real post on the Our Little Place blog. The blog will feature stories on those who author the books Our Little Place sells or if they are about them. There will always be that common link but not so much as a review of the book itself. 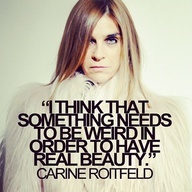 My latest style crush and book obsession is Carine Roitfeld : Irreverant, have you read it yet? Seriously, such a fabulous book. It's a large format book that has a case that the book slides into.